The microelectronics evolution has given rise to many modern benefits but has also changed design methods and attitudes to learning. Technology advancements shifted focus from simple circuits to complex systems with major attention to high-level descriptions. The design methods moved from a bottom-up to a top-down approach. For today’s students, the most beneficial approach to learning is this top-down method that demonstrates a global view of electronics before going into specifics. Franco Maloberti uses this approach to explain the fundamentals of electronics, such as processing functions, signals and their properties. Here he presents a helpful balance of theory, examples, and verification of results, while keeping mathematics and signal processing theory to a minimum. Inside this book you will find a complete explanation of electronics that can be applied across a range of disciplines including electrical engineering and physics. This comprehensive introduction will be of benefit to students studying electronics, as well as their lecturers and professors. Postgraduate engineers, those in vocational training, and design and application engineers will also find this book useful. Franco Maloberti is currently Professor of Microelectronics and Head of the Micro Integrated? Systems Group at the University of Pavia. His specialized subjects are in the design, analysis and characterization of integrated circuits and analog digital applications, mainly in the areas of switched-capacitor circuits, data converters, interfaces for telecommunication and sensor systems, and CAD for analog and mixed A/D design. He has written four books and over 370 papers on these topics, and holds 27 patents. Recipient of the XII Pedriali Prize for his technical and scientific contributions to national industrial production, Dr Maloberti was also the co-recipient of the 1996 Institute of Electrical Engineers Fleming Premium, the best Paper award, ESSCIRC-2007, and the best paper award, IEEJ Analog Workshop-2007. He received the 1999 IEEE CAS Society Meritorious Service Award, the 2000 CAS Society Golden Jubilee Medal, and the 2000 IEEE Millennium Medal. Dr Maloberti was the President of the IEEE Sensor Council from 2002 to 2003, and Vice-President, Region 8, of the IEEE CAS Society from 1995 to 1997, also an Associate Editor of IEEE TCAS-II. He is an IEEE Fellow and is presently serving as VP Publications of the IEEE CAS Society. ELvisLab Lite a freely available demo version for potential users of the book. ELvisLab Pro the full version, password protected for owners of the book. ElvisLab (ELectronic VIrtual Student Lab) allows students to do experiments in a virtual environment with plenty of virtual instruments and pre-built circuits or systems. An integral tool to the book, it allows the user to change the inputs, see what happens and try to understand the reasons why. 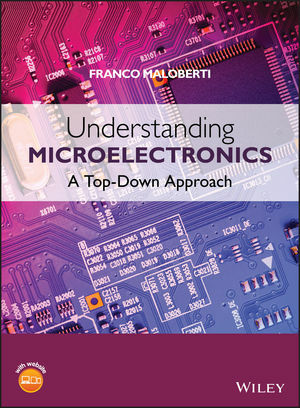 Understanding Microelectronics A supplementary website contains PowerPoint slides for lecturers. Author is well-known and respected in academia, as well as being an award-winning practitioner. State-of-the-art in that this method follows the evolution of CAD tools that are focusing more on high-level design. A useful balance of theory, example and verification of results. Supplies a number of computer examples whose source code will be available for download on a supplementary website.